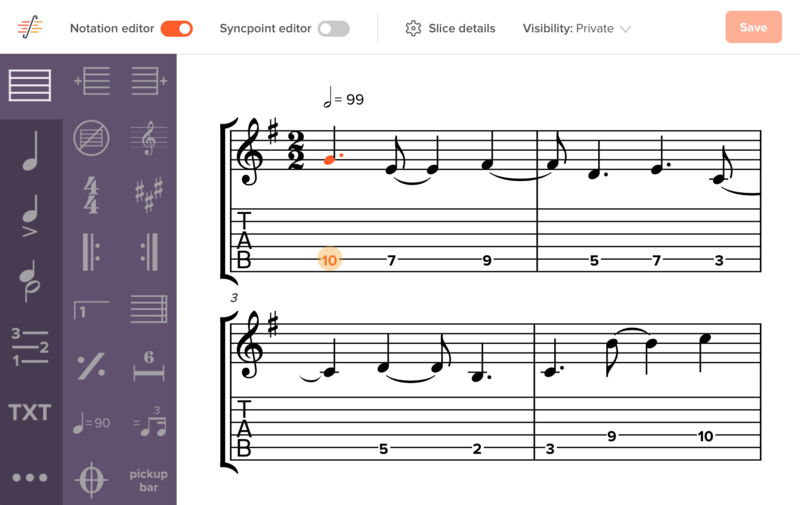 Create sheet music and tablature in a simple, beautiful, web-based interface. Free. Start from scratch, or edit an existing score. We can read several types of files, including MusicXML and Guitar Pro. Everything works in your web browser, saved in the cloud. No downloads, no plugins. Desktop apps are so 1995. Music notation is complex. We try to make it painless, with plenty of keyboard shortcuts and simple editing tools. When you use Soundslice, you create something more interesting than sheet music. You create an interactive experience that integrates music notation with real human performances and practice tools. There’s nothing like it. And your students, bandmates and fellow musicians will love what you create. Here’s an example. Transcribing existing audio/video? No more juggling slowdown software plus YouTube plus a separate notation editor. Everything’s integrated in Soundslice. Import YouTube videos, MP3s or other video files — and you can see, hear, slow down and loop the recordings as you notate. That means you get instant feedback as you work. The end result is a more accurate transcription, plus beautiful notation that’s synced with a human performance. There’s never been a better way to learn from a recording. Finally, web-based notation software that treats tablature with respect. We natively support nearly every kind of tab marking: bends, slides, harmonics, tapping and more. No need to hack around your notation software to make proper tab. And for those of you who “think in tab” rather than notation, our tab entry is optimized for you. Just enter fret numbers and strings, and we’ll automatically put the notes in. When you’re ready, it’s easy to share your work with the Soundslice community, so people can learn it, comment or post cover versions. Of course, you’re always welcome to keep things to yourself, too. We have no limit on how many pieces you make public or how many you keep private.